The American Platinum Eagle was first issued in 1997, as an extension of the American Eagle Bullion Program. The platinum coin was added to the existing offerings in gold and silver which had been previously introduced in 1986. The Platinum Eagle is the first and only investment grade platinum coin issued by the United States Mint. The obverse design of the coin features a rendition of the Statue of Liberty designed by John Mercanti. It bears the inscriptions “Liberty”, “E Pluribus Unum”, and “In God We Trust” as well as the date. 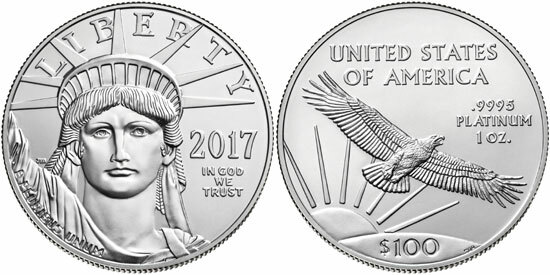 The reverse design of the bullion coins features a soaring Bald Eagle against a rising sun designed by Thomas D. Rodgers Sr. The inscriptions include “United States of America”, “.995 Platinum”, the denomination, and platinum content. From 1998 to date, numismatic versions of the coins have featured annually rotating reverse designs created by various artists. During the course of the series, the American Platinum Eagle coins have been offered in four different sizes. Each contains its indicated weight in pure platinum and carries a legal tender face value. The four denominations were offered for both bullion coins and collectible proof coins from the introduction of the series in 1997 until 2008. The collectible uncirculated coins were available across all four options from 2006 to 2008. From 2009 present the proof coins have been offered in one ounce size only. The bullion coins were not produced from 2009 to 2013, but resumed in 2014 in one ounce size only. Similar to Gold and Silver Eagle bullion coins, Platinum Eagle bullion coins are not sold directly to the public. The United States Mint distributes the coins through a network of authorized purchasers who in turn resell the coins to other dealers or the public, as well as establish a two way market for the coins. There is no legal requirement for the US Mint to produce platinum bullion coins each year. Since the beginning of the series, the United States Mint has offered collectible proof versions of the coins for sale directly to the public. Initially, each denomination was offered for sale individually, or as part of a four coin set. For the first year of issue in 1997, the US Mint offered a special “Impressions of Liberty” set containing one ounce 1997 Proof Gold, Silver, and Platinum Eagle coins. Starting in 1998, a series of annually rotating reverse designs were used frequently surrounding different multi-year themes. From 2006 to 2008, the US Mint offered collectible uncirculated versions of the coins directly to the public. These coins were offered in all four denominations, for sale individually or as a four coin set. The coins differ from the bullion coins by the inclusion of the “W” mint mark and the use of the rotating reverse designs also used on proof coins. Platinum Eagles are the only platinum bullion coins with their weight, content, and purity guaranteed by the US Government. The composition of each coin is .9995 fine platinum. The $100 face value coins have a weight of 1.0005 troy ounces yielding a weight of one pure ounce of platinum. The diameter of the coin is 32.7 mm with a thickness of 2.39 mm. The $50 face value coins have a weight of 0.5003 troy ounces with diameter of 27 mm and thickness of 1.75 mm. The $25 coins have a weight of 0.2501 ounces with a diameter of 22 mm. The smallest $10 coins weigh 0.1001 troy ounces and have a diameter of 16.5 mm.